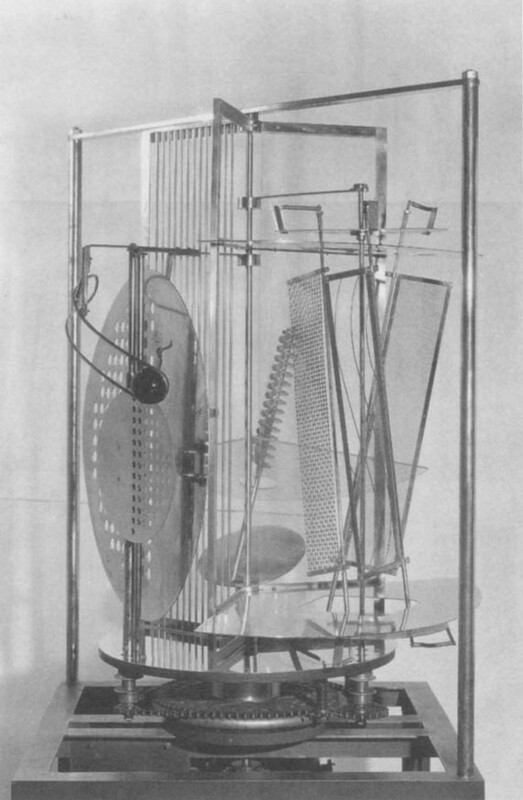 László Moholy-Nagy, Kinetic Constructive System, 1922. 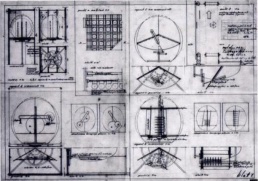 Stefan Sebök, Construction drawing for Light Prop for an Electric Stage, 1930. Vesnin brothers, S. Liashchenko, Stefan Sebök, Paveletskaya metro station, 1939. Stefan Sebök was a Hungarian-born architect who worked with Walter Gropius in Dessau and Berlin in the late 1920s, and then with fellow Hungarian emigré László Moholy-Nagy on his famous Light Prop, and later moved to the Soviet Union to work with the constructivist architects Moisei Ginzbrug, El Lissitzky and the Vesnin brothers. In between he carried out numerous projects of his own and found himself central to a key generation of emerging modern architects in Dresden, Berlin and Moscow. The following text is based upon an article published in Bauhaus-Online Magazine. Sebők István (Stefan) was born in 1901 in Szolnok (Hungary), where he received his primary and secondary education. Early on he showed talent for art. On completion of his schooling he aimed to study architecture. He was accepted in Dresden in 1921 at the Hochbau [Architecture] faculty at the Sächsiche Technische Hochschule, opting for the science oriented course, but chose art for his optional subject. The university records show him as a highly achieving student and he was given the opportunity to do a research project on Viennese Baroque, which he presented in 1925 as an illustrated public lecture at the Dresden Kupferstichkabinett. In 1926 he submitted his Diploma work, a project for the design of the Tanztheater, Dresden, probably inspired by the presence of the famous dancer Gret Palucca in Dresden at the time. The work had many innovative features aiming to minimise the interface between stage and spectators. He received his diploma Dip. Ing. Arch. in March 1927. Although he already had a firm position offered by Erich Mendelsohn at the time, he decided to join Walter Gropius in Dessau. The main attraction for Sebök was the recently commissioned revolutionary theatre by Erwin Piscator. 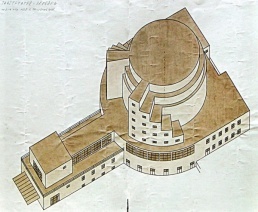 Although the theatre did not materialise at the time, the concept of the possible use of films, the stage and roof design, was reworked by Sebök in several drawings over the years and it found its continuation also in a plan worked out by Gropius and Sebök in 1930 for a theatre for Kharkov for mass performances for which many of Sebök’s annotated preliminary sketches have survived. In 1928 Sebök briefly returned to Dresden, probably to re-work his Tanztheater for the Internationales Problem Theater. From 1928 till 1931 Sebök rejoined Gropius in Berlin participating in numerous projects. Sebök also collaborated closely with László Moholy-Nagy on the Kinetisch-konstruktives System [Kinetic Constructive System] and the Light space modulator. The collages for these are marked durchconstruirt [constructed] by Sebök and the technical drawings for the latter bear his signature. 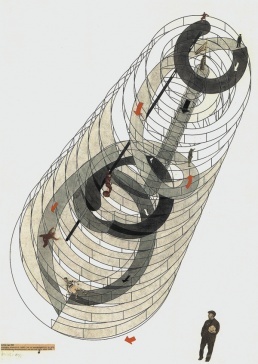 During 1929 he was also involved with Moholy-Nagy in various stage designs for Erwin Piscator. During this period he pursued a number of personal projects. In 1929 he entered a competition for the theatre (cinema) in Györ, Hungary, and in 1930 for a monument for the Ukrainian poet, Tarras Shevchenko. His modernistic tower was to supply the passers-by with visual communication in the form of posters, photos, films and also by the speeches and theatre groups on the performing platform, and they in fact could choose their desired film. One can regard it as the first interactive media. The project only survives in a small leporello presented to Gropius by Sebök at that time. Sebök also participated in the first international Austellung der Fotomontage, which took place in Berlin at the Lichthof of the Kunstgewerbemuseum. His last documented activities in Germany were his involvement with the architectural installations of the Soviet pavilions at the Leipziger Messe. In July 1931, he left Germany for the Soviet Union. While architectural motivation may have played a part, a strong drawing force was probably a young Russian chemist he met in Berlin, whom he later married. He left a number of his belongings in Gropius’s attic, including copies of the Tanztheater, preliminary sketches for the Kharkov theatre and some other buildings. When Gropius left for the United States, he handed these to Herbert Hoffmann, Sebök’s friend from Bauhaus days, who passed some to the Bauhaus and kept others till his death. They became part of his legacy to the Akademie der Künste. Most of our information about his time in Russia comes from a letter written to Gropius in 1936, and from the KGB archives. Initially he worked for the architectural department of the railways later with El Lissitzky and the Vesnin Brothers. 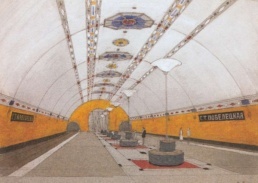 His last known project is one of the Metro Stations (Metrostation Paveletskaya-Donbaskaya, competition project for the third stage of the Moscow Metro) with the Vesnin Brothers in 1940/41. 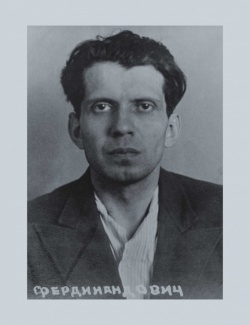 He was arrested on 22 June 1941 in his apartment on the charge of spying for the Gestapo. According to the KGB archives his place of employment at the time of his arrest were the Narkomneft (Vesnin’s) studios. He was sentenced to be shot. However, he died in prison of malnutrition and dysentery, before his execution in April 1942. In 1997 Sebök was rehabilitated. Éva Bajkay, "Hungarians at the Bauhaus", in Beyond Art, ed. Peter Weibel, Springer, 2005, p 75.